Boy Scouts of America is about teaching youths to become leaders. Boys learn outdoor skills, first aid, cooking skills, and most importantly have fun. Boy Scouts of America, Tr﻿﻿﻿oop 13 chartered at the Rod & Gun Club of New Bedford in North Dartmouth, MA continues to be one of the most successful Scouting programs in the area and is also the only Scouting unit in the state chartered at a gun club. The Troop is run by a group of adult and youth leaders who are committed to delivering the program to its youth members, delivering ethical and moral lessons in an outdoor setting and instilling in them the values of the Scout Oath and Scout Law. Troop 13 meets weekly in the club house on Wednesday evenings at 6:30 till 8:30pm, September through June. We camp once a month either at our campsite on the grounds of the The Club or at other locations around New England. 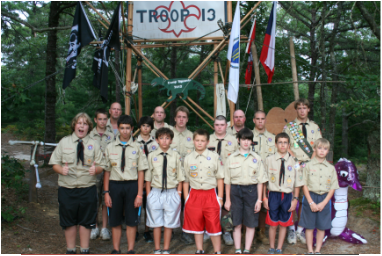 Troop 13 attends summer camp for one week in August. General outlines of planned events can be obtained at RGCNB monthly general membership meeting held on the third Tuesday of each month, September though June. Detailed schedules of our activities are available to our members. Members of Troop 13 are required to pay an initial registration fee, pay monthly dues, buy a Scout uniform, Scout book, and personal camping gear. ﻿﻿﻿Participation is open to young men ages 10 1/2 and up and male and female adults of all ages, club members and non-members alike. Adults who are interested in joining Troop 13 will be required to pass a criminal background check, and for the safety of our youth members, our meetings are not open to drop in visits. If you are interested in Troop 13, please refer to the contact information below to schedule a visit.